It's 2999, and what do you know? The world is at war... or else what's left of it is. Our narrator Otto Behr is, at the outset, an agent engaged in an operation in the latter days of the Crusades when he's pulled out of the period to assist with a major manoeuvre in World War II era Germany. Here, another operative has been helping Hitler win the coming conflict at the same time as attempting to temper his more monstrous qualities. Sickening as it is, Seydlitz's plan is borderline brilliant, and abominably ambitious. It's "a direct assault upon the very heartland of Russia—and if this works..." (p.34) why, if this works, the long war will be all but won. You see, nothing is ever straightforward in Time. If we both did the same old things, time and again, it would soon become predictable. And though the aim is to win—to eradicate the enemy—there is also a feeling, and I know I'm not alone in this, that the game is of itself a satisfaction, and a deep one at that. Surviving what's to come will be all the harder, however, because Russian agents have been aware of Germany's great operation from day dot, and before it can come to something, they step in, seize Seydlitz, and use his DNA to infiltrate the future, too. It's here that The Empire of Time gets good, too. Beforehand, as the synopsis suggests—and I haven't even mentioned the many pages Otto spends slavering over a pretty lady in the past—the narrative is sadly scattershot, such that some readers likely to love the narrative's latter half will be rebuffed by the time it takes to get there, not to speak of the tedium that wreaths some of these extended digressions. 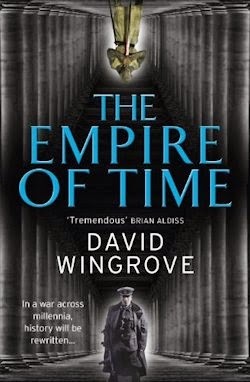 Yet when Wingrove finally arrives at The Empire of Time's throughline, the whole mind-boggling ballgame begins again, and it's as gripping a spectator sport as any of the superlative science fiction released recently. There isn't an awful lot to Otto, but what there is—his unswerving love of his country, his habit of becoming besotted by beautiful women, and his recklessness, yes—paints an appealing picture: of a time-travelling 007 of sorts. He has a Q and an M as well; in that regard, all that The Empire of Time lacks is a single wicked villain for Otto to match wits with. And so, I have high hopes for Roads to Moscow as a whole. The Empire of Time might take a while to hit its stride, but when it does—particularly given that this is the setup for a series spanning the distant past through the far-flung future—it's well worth the effort expended, doubly so given Corvus' deplorable decision to abandon their recasting of Chung Kuo. I dare say David Wingrove deserves better. His devoted readership undoubtedly does. But if you can't get something done right, best to do it yourself; thus, though it might take time, the remainder of said series will be self-published subsequently. In the interim, there's this—and it isn't insignificant. Indeed, The Empire of Time could be the beginning of something brilliant: Blackout meets Bond in a relentless race war Wingrove depicts with deftness and deference.